What is the full list of ingredients in your supplement? Where do you ship Ultimate Canine from? I have a Small Breed dog - is your supplement OK for small breed dogs? I have a Large Breed dog - is your supplement OK for large breed dogs? Do different sized dogs require different dosages of the supplement? Do different breeds of dogs require different dosages? Can I use your supplement with my puppy? Is your supplement meant to be taken every day? How long will one jar of your supplement last? I feed my dog a home-made diet. Can I use the supplement? I feed my dog regular dog food that I buy from my pet supply store. Can I use your supplement? Can I give Dr. Jones' Ultimate Canine Health Formula to my cat also? My dog is fussy, and he/she refuses to eat certain things. Will my dog like your supplement? My dog is very healthy - does he/she really need a supplement? My dog is on a very high quality, balanced kibble - does she/he still need a supplement? My dog's food already has a lot of additional vitamins and minerals - does she/he still need a supplement? If my dog's food already has vitamins and minerals added, is there a danger of 'overdosing' or 'over-supplementing' - giving them too much of a particular vitamin or mineral? Do supplements really make a difference? If my dog is healthy, how will I know if the supplements are actually helping? How long should it take before the supplement has a visible effect on my pet's health and wellbeing? I feed my dog a Raw Food diet. Would I need a supplement even if I am feeding a species appropriate (raw) diet? Is your supplement okay for dogs that are on weight restriction diets? If my dog doesn't have joint problems now, is it still okay to give him/her glucosamine and chondroitin? My dog is allergic to chicken. Should my dog take your supplement? Will there be any side effects if my dog takes your supplement? I have a dog who takes prescription medication - would your supplement cause a reaction in my dog? My dog has Cushings Disease - would it be okay for him to take your supplement? Would your supplement be good for a dog with digestive problems? Does it contain a pro-biotic? My dog has Heart Disease and is currently on medication - would your supplement be okay to give him/her, and would it help? Is your supplement safe to give to my dog? Is what is listed as ingredients really in the bottle? Are there any fillers in Dr. Jones' Ultimate Canine Health Formula, and if so, what are they? Is your supplement safe for long term use? Does your supplement contain any artificial colors or preservatives? Is your supplement naturally preserved? Is your supplement absorbable - will my dog absorb and actually benefit from your supplement (is it in a bio-available format)? Does your supplement contain all the essential vitamins and minerals my dog needs? If my dog is taking your supplement, will I have to supplement with anything else? Do you ship to the UK / Europe / South Africa / New Zealand / etc - is your supplement available internationally? Can your supplement be fed to breeding/nursing dogs? I have several dogs / I am a breeder - do you offer any volume discounts? What form is your supplement in - powder, pill/capsule, or liquid? Dr. Jones' Ultimate Canine Health Formula is a powder. Where do you ship Ultimate Canine from and when can I expect delivery? Dr. Jones' Ultimate Canine Health Formula is shipped from our warehouse in Colorado, in the US, and from our warehouse in Richmond, BC Canada. For US orders, with Standard shipping, you can expect delivery within 3-6 business days (with USPS First Class). For Canadian orders, with Standard shipping, expect delivery within 2-6 business days (via Canada Post), and for International orders, with Standard shipping, expect delivery within 15 - 30 business days (via USPS First Class International). For Trial orders (your first order on the trial plan only), as per our guarantee, in the unlikely event that you find Dr. Jones' Ultimate Feline Health Formula unsatisfactory, we will refund 100% of your order including any shipping fees. To request a refund, Contact us with your request and we will issue an RMA number with instructions on where to return your jar, and as soon as your order has been returned and verified by the warehouse, we will issue a refund for the cost of the jar only. We will not refund any shipping fees paid, plus there will be a restocking fee of 8% of the cost of the item. Yes. Dr. Jones' Ultimate Canine Health Formula is helpful for all sized dog breeds. No. The recommended dosage is just based on the weight of your dog, not the breed. Dr. Jones' Ultimate Canine Health Formula is designed with Adult and Senior dogs in mind. It is safe to give to your older puppy - but since most puppies are very energetic and healthy, you won't see much of a difference in them if they do take the formula. So, it's generally not necessary - unless you are providing a home diet and would like to ensure they receive additional vitamins and minerals, or your puppy already has health issues. If you do choose to give the supplement to your puppy, here's the guideline: for small breeds, do not start giving them the supplement until after the age of 6 months, and for medium and large breeds, the age of 9 months. Once your puppy becomes an Adult at 1 year of age, start them on full doses for long term disease prevention. Yes. Dr. Jones' Ultimate Canine Health Formula is a daily supplement that you add to your dog's food every day. Depends on the size of your dog. One jar (one order) of Dr. Jones' Ultimate Canine Health Formula is based on a 30 day supply for an average, 50 pound dog. If your dog is smaller, one jar may last more than one month - if larger, one jar will last less than one month. Yes. Dr. Jones' Ultimate Canine Health Formula can be used with a both a home-made diet and a regular kibble / commercial diet. No. Dr. Jones' Ultimate Canine Health Formula is strictly a dog supplement. We do have an equivalent cat supplement, Ultimate Feline. Click here for Ultimate Feline. Yes. Dr. Jones' Ultimate Canine Health Formula is flavored with chicken, to make it tasty. Almost all dogs who have tried the supplement have liked it and will eat it by itself, right out of their bowl - many get just as excited as if you are giving them a treat. But if your dog is very fussy, I find that just mixing the powder in with a favorite treat works well. For basic health and survival, no, your dog does not need a supplement. But for optimum health, for your dog to thrive, YES. The point of a supplement is to give your dog that extra advantage, to help fight off disease and give your dog a better chance for a long and healthy life. Yes. Even the best dog foods do not contain all of what you'll find in Dr. Jones' Ultimate Canine Health Formula. The point is to give additional nutrients for that extra advantage. Most dog foods, including some of the best, only provide basic levels of nutrients required for survival, not enough for your dog to really thrive. Yes - refer to the question above. No. Even added to the best foods, Dr. Jones' Ultimate Canine Health Formula will not cause an 'overload' of any particular vitamin or mineral. Just as with humans, the only way to get too much of a nutritional supplement it is to 'overdose' by a very large degree. If your dog is young with no current health issues, you may not directly notice a change now. The major benefit of giving Dr. Jones' Ultimate Canine Health Formula to a young, healthy dog is PREVENTION. This is something I always advise my clients: if you can do anything to help prevent disease in your dog in the long run, do it - with better food, fewer vaccines, and supplements. If your dog develops a serious disease such as cancer, the cost to you and your dog, both financially and emotionally, will be more than the cost of a daily supplement now, by far. Just ask anyone who has a dog now with a serious health condition, or anyone (including myself) who lost a dog before his time. Depends. If your dog has health issues now, you may see a dramatic change within a couple of weeks, but it depends on several factors - what the problem is, how long your dog has had it, what sort of treatment you have been doing up to this point, etc. If you read the comments some of our clients have sent in, you'll read about some who have seen results in days. But on average, you should see noticeable results within one month. If your dog is healthy now, please see question above. Yes. Although Raw Food Diets are better in many ways, in my clinic I still see dogs on raw diets getting cancer, allergies, and auto-immune diseases. Raw Food Diets are not the complete solution. Yes. Dr. Jones' Ultimate Canine Health Formula will not interfere with a weight restriction diet, and may help the weight loss process through improved overall health. Yes. Both glucosamine and chondroitin are found naturally in the body. Glucosamine is needed to produce glycosaminoglycan, a molecule used in the formation and repair of cartilage, and chondroitin gives cartilage elasticity and it prevents cartilage destruction. Production of glucosamine slows with age. So while your younger dog may not have joint issues now, additional glucosamine and chondroitin will not cause any problems, and may help your dog avoid a joint problem later in life. That depends. Most dogs with an allergy to chicken can take Dr. Jones' Ultimate Canine Health Formula. Usually, I find that dogs with a chicken allergy are not acutely sensitive to chicken - most only have a reaction if their daily food contains chicken. In other words, if they have a diet with chicken as the primary protein source, they have an allergic reaction. 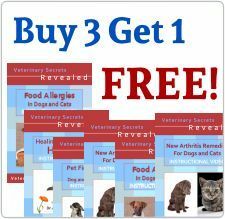 Dr. Jones' Ultimate Canine Health Formula does contain chicken, but it is in a small amount, so most dogs with chicken allergies should be able to take it. Yes, your dog should take Dr. Jones' Ultimate Canine Health Formula even if they have a mild allergy to chicken. If your dog is very sensitive to chicken - if he/she reacts to even a small amount of chicken - then No, do not give Dr. Jones' Ultimate Canine Health Formula to your dog. No. Dr. Jones' Ultimate Canine Health Formula is not a pharmaceutical drug - it is a naturally derived health supplement. All ingredients are either in their natural form or they are derived from a natural source - there will be no side effects unless your dog has a pre-existing sensitivity to a particular ingredient. Point to note - when some dogs start on Dr. Jones' Ultimate Canine Health Formula, they can go through a bout of diarrhea. This is quite normal when just starting on a concentrated health supplement - for both humans and pets! This is referred to as "going through a nutritional boost", but it shouldn't last. If it is continuous, just go off the supplement for a few days until things "stabilize", then slowly reintroduce it into the food again in smaller amounts, then work up to the recommended dosage. No. Dr. Jones' Ultimate Canine Health Formula is not a pharmaceutical drug, and will not cause reactions or side effects like prescription medication. Please refer to the question above. Yes. If your dog is on medication for Cushings, he/she will be able to safely take Dr. Jones' Ultimate Canine Health Formula. Yes. Dr. Jones' Ultimate Canine Health Formula contains a pre-biotic and pro-biotic blend, to help dogs with digestive problems. I have a dog with Kidney Disease - would it be okay to give your supplement to him/her? Yes. Dr. Jones' Ultimate Canine Health Formula contains no added phosphorus or anything else that would cause any problems with a dog with kidney disease, and it may help improve the health of the kidneys over time. Yes. Dr. Jones' Ultimate Canine Health Formula is safe to give to a dog on heart medication, and the Omega 3 Fatty Acids plus the additional antioxidants may help with heart disease. Yes. Dr. Jones' Ultimate Canine Health Formula is proven to be safe. All ingredients are Human Grade - which means a higher standard than almost all other dog supplements. Once the materials are blended, they are tested again to ensure they match what is on the label. The formula undergoes 3rd party testing to ensure that the ingredients are exactly as stated, that they are active, and that they contain no harmful bacteria or toxins. All testing is conducted by an independent 3rd party lab. All manufacturing of Dr. Jones' Ultimate Canine Health Formula takes place in an FDA approved facility and complies with Good Manufacturing Practices (GMPs). Yes. Refer to the answer above. Yes. Dr. Jones' Ultimate Canine Health Formula undergoes 3rd party testing at an independent lab to ensure that the ingredients are exactly as stated on the jar. The USA. Dr. Jones' Ultimate Canine Health Formula is made in the state of Utah, in the USA. Most of the supplement's ingredients are sourced locally (within the USA), and all suppliers we use are certified, highly reputable suppliers of human grade supplement ingredients. Nothing is left to chance - all ingredients are tested and verified before AND after they have been added to Dr. Jones' Ultimate Canine Health Formula. We stand by our suppliers 100%. No. Dr. Jones' Ultimate Canine Health Formula contains no fillers. Other than the beneficial ingredients listed, the only additional ingredients are dehydrated chicken, for flavor, and silica, an inert, non-toxic, indigestible (it completely passes through the digestive system) product derived from sand that is used to help keep the powder dry. Yes. Dr. Jones' Ultimate Canine Health Formula is meant to be used over the long term, it is not meant to be used as a short-term fix (although you may see results very quickly). As with all other natural health treatments, the major benefits will be seen in the long term - improved health in a multitude of ways and a longer life. No. Dr. Jones' Ultimate Canine Health Formula contains NO artificial colors, flavors or preservatives. Yes. Dr. Jones' Ultimate Canine Health Formula is naturally preserved with Vitamin E. There are NO artificial preservatives in Dr. Jones' Ultimate Canine Health Formula. Dr. Jones' Ultimate Canine Health Formula has an expiration date stamped on the bottom of the jar. It will last for a very long time unopened (kept in a cool, dry place), and 4-6 months if opened (with the lid closed tightly, stored in a cool, dry place). It does not require refrigeration, but it may help it stay fresher if you are using it over a long period of time. Yes. Dr. Jones' Ultimate Canine Health Formula is in the most bio-available format - as in easiest to digest - while still being in supplement form. It wouldn't be possible to provide all of the nutrients in Dr. Jones' Ultimate Canine Health Formula in their original state at the levels contained in the formula - you would be feeding an enormous amount of material daily, and it wouldn't be in a convenient format. All of the nutrients in the formula are derived from the natural source, but with the supplement in this format, we are able to provide optimal levels of nutrients in a convenient form, and still have it easily digestible. Yes. Dr. Jones' Ultimate Canine Health Formula contains all the vitamins and minerals essential for the health of your dog. If you feed Dr. Jones' Ultimate Canine Health Formula with an adequate home-made diet, you'll be providing your dog with all the nutrients he/she will need. No. Dr. Jones' Ultimate Canine Health Formula contains all vitamins and minerals essential for the health of your dog, and additional ingredients to help your dog thrive. You will not have to add anything else to your dog's diet. Yes, except Australia. We ship Dr. Jones' Ultimate Canine Health Formula worldwide, with the only exception being Australia (and we are currently working on obtaining an import permit for Australia). Yes. Breeding and nursing dogs have a higher nutritional requirement, and will benefit from Dr. Jones' Ultimate Canine Health Formula - and there will be no threat or harm to nursing puppies. Yes. Please email us (support "at" ultimatecaninehealth.com) for more information about volume discounts.